Generation X (the thirteenth generation or the baby busters) have experienced some of the world's greatest crises - Gulf War, Tiananmen Square and Milli Vanilli lip-syncing. In our day, kids brought lunch to school not guns, research was done at the library not via Google and when we sent mail - we had to write with a pen on a piece of paper, lick a stamp and take it to the post office. 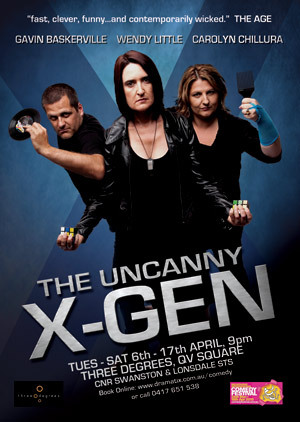 Three of Australia’s “Generation X of comedy” - Gavin Baskerville (Moosehead Award recipient 2005), Carolyn Chillura (Parental As Anything) and Wendy Little (The Sheryls, The Middle Ages) give their take on what it’s like to be a Gen Xer sandwiched between the blame-shifting Boomers and the whiny Gen Y’s. If it wasn’t for Gen X, there would be no increase in the divorce rate, no yuppies, no video games and no Brian Mannix.